Skateboarding is a great sport for kids as well as adults. It is not just a skill but a profession to some. If you want your child to indulge in skateboarding then better start at an early age. Skateboarding doesn’t just need skills but also a certain amount of adventure in the child. It has become a matter of common interest among kids of small age, mostly less than 5. Skateboarding is a great way of exercise as well because your entire body has to participate in it. Other than that, the sport teaches your child how to be patient and to get back on their feet, after falling countless times. Once when they master the art, their self-esteem and confidence are boundless. So, when we talk about skateboarding, the first and only gear required for the sport is a skateboard. Your child will be spending a lot of time with it and ride it so as parents, this is your responsibility to get them an uncompromised skateboard. How Building Your Own Skateboards? What is the difference between a mini board and a regular size skateboard? What are the materials used in the making of a skateboard? What are the pros of kids skateboarding? What safety features should I look for while buying a skateboard for my child? How to store a skateboard? Buying the first skateboard for your child can be an overwhelming experience. Being parents, you always want to provide the most significant things to your child. This becomes more complicated when you start with the search, and hundreds of options appear on the page. This task is not as easy as it seems. Every skateboard is different and has unique features. Some of the boards are only for cruising whereas others allow you to do all kind of tricks. So, the first thing is to decide what you will be using a skateboard for. Will you be using it on a routine basis? Is it for a hobby? Is it for competition practice? What is the surface of your skating practice? Will you be skating in a park or streets? We cannot answer these questions for you. So, you have to consider all these elements while searching for the most exceptional product. In this buyer’s guide, we will help you through the stringent segments to consider as you pick the first skateboard for your child. Skateboarding is fun, but it can be equally dangerous. Apparently, the sport is not for all the kids. Therefore, first, you should recognize if your kid is up for skateboarding or not. Well, if the answer is yes then while searching, your prime concern should be about the safety of the child. The innovative models that are manufactured these days are incredibly safe. These boards have all the essential safety features such as balance correcting decks, light-up wheels, etc. Skateboards are famous for having witty and unconventional designs. This leads to extensive design options available in the market that you can choose from. It all comes down to the kind of design your child will like. Knowing their taste can make your work much more accessible. The brands don’t only offer happening designs but make sure to incorporate various colors to these designs as well. Knowing the taste and likes of your child, make sure to buy the designs that they will like. It will be even better if you can allow the children to pick the model on their own. Skateboard is a kind of gear that is available in various sizes. There are skateboards, specially designed for the kids. Now, in kids too, the size of the skateboard varies with age. For example, a 5 – 6 years old kid will have different requirements than an 8 – 12 years old kid. You need a board that is neither too small for the kid and nor too large. A little tip here is to keep the width of the board in more consideration than the length. The ideal width of a skateboard for kids is 6 – 8 inches. Therefore, make sure to keep the size of the board in notice while making a purchase. Lastly, we would say that selecting the right material of skateboard is also of equal relevance, slightly higher. Since most of the boards are made of wood, you have to make sure that it is sturdy and durable. Most of the boards are made from Canadian maple. There are various layers to the skateboard deck. The increased number of layers also improves the reliability of the board. It is essential to search for the pro boards that are made of metal trucks as they are the ones to provide support to the decks. Further in this article, we would like to introduce the 8 best skateboards for kids that you can consider purchasing. All these products are selected after thorough research and assimilating reviews from various top-notch websites. This Powell Dragon skateboard is fashioned with the beguiling design. It has black and red dragon drawn on it that boys will absolutely love. The 31-inch long board is suitable for differently-sized kids. This board is 7 inches wide. The wheel dimension is 54 x 37 mm. The robustness and durability are increased by the polymeric strap. The extra wide wheels ensure smooth rides. This model is suitable for kids up to 200 pounds in weight. The weight of the skateboard is quite light. The Powell Golden Dragon is economically priced. Being durable and lightweight is definitely a pro. The overall material used in construction is also commendable. This is a highly-appreciable product for beginners and kids. This model from Powell Golden is yet another expressively designed piece for young boys. Just like the other model, this one also has a black and red dragon imprinted on it. 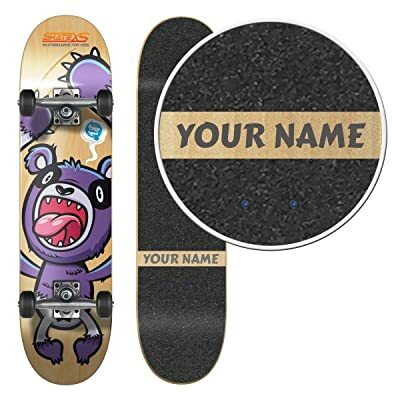 It has got a concave deck design that gives you the opportunity to do various tricks. The length is almost the same as its predecessor which is nearly 31 inches. The dimensions of this model are 31 x 7.5 x 6 inches which makes it a perfect purchase for kids over 8. The metal wheels are praiseworthy and ensure smooth performance. This is a durable model that comes with the warranty and reliability of Powell. It has also got great endurance. The metal-made struts on the board ensure heavy-duty riding. Also, the price is just right as far as affordability quotient is concerned. If your kid is fond of cartoons, then this is unquestionably a great choice to make design wise. The company has designed the skateboard, keeping kids in mind and what they would love to buy. Moreover, this is a well-crafted skateboard that will enhance their skills in the sport. Even though this is a kids product, the quality is equivalent to that of adult skateboards. This one is available in a massive choice of 8 different colors. There is versatility in sizes as you can select the skateboard for kids in age groups of 5 – 7, 8 – 10, 11 – 12. The length of the board is 28, 29, and 30 inches while keeping a constant width of 7 inches. This is a lightweight model made of bamboo wood. It is sturdy in design and completely environment-friendly. This model is a complete value of money product and affordably-priced, keeping in mind the kids of different age groups. The weight is so less that even if it accidentally falls on the child, no harm will be caused. Well, the design of this board is classic and it has no fancy attributes in it as far as looks are concerned. Kids that don’t like to overdo with the skateboard looks will surely admire the simplicity. This one is 28 inches in length, probably the longest in our list. You can find a variety of 8 different designs and colors. The material used in the making is bamboo and durable maple which fortifies the strength and durability of the product. Wheels work smoothly and are shock-absorbant for exciting rides. The price of this model is also considerable. However, the USP is the anti-bite technology which prevents the wheels from hitting the skateboard after a harsh landing. Your kid can also enjoy various tricks without worrying about breaking the board. Checker is among the designs that go with the personality of little boys and girls. The Krown Rookie skateboard has fantastic designing, and there are plenty of colors for you to choose from. This has got the durability of black diamond grip tape. The width of the board is 7” which is pretty good for the kids. The length of 31.5 inches is also reasonably good. The concave design allows you to try the tricks with the skateboard conveniently. This particular board has aluminum wheels that makes it smooth in performance and quite light in weight. As far as pricing is concerned, this is among the most reasonably priced skateboards in the market. If you are searching for the best skateboard for your girl, then this model from Punisher is an important choice to make. It has beautiful butterflies imprinted on it with a background in pink. The concave design is also quite easy to push. With a width of 7 inches, this model is suitable for kids from 5- 10 age groups. The lightweight skateboard weighs not more than 7 pounds. The material used in the construction is Canadian Maple which is not just lightweight but extremely durable. This is a long lasting product and has an excellent design to impress the little ones. Price is also right although you won’t find it extremely economical. However, the craftsmanship is incredible at this price. 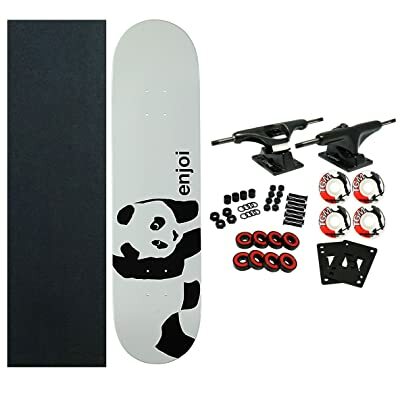 For the kids who want to keep it simple, the design of Enjoi Whitney Panda will be quite tempting. 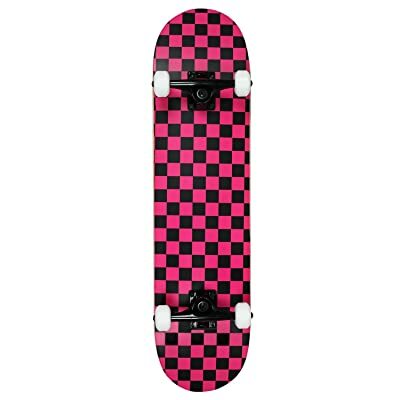 This is a reliable skateboard for all kind of activities, i.e. riding and for sports performance. This is also quite great for the first-timer as it can go through immense wear and tear. The solid, metal-made skateboard trucks provide sturdy and safe rides. It has suitable dimensions of 7.75 x 31.5 inches which is great for kids of different age groups. The craftsmanship is highly commendable and done in a concave shape to provide more maneuverability the user. The skateboard is remarkably light in weight and made of Canadian Maple wood. Also, the aluminum wheels make it pretty useful and ensure smooth rides. The costing is also done reasonably. This model from Positiv brand is an exclusive model. Although it is priced extremely high, this is one of the most dependable and safe skateboards in the market that is designed impeccably. The length of this one is 31 inches and 8 inches wide. This product allows kids to enjoy flexible movement on a skateboard. The quality is unparallel and offers a firm grip. Kids will find the movement quite convenient. This product is among the best skateboards on our list. Buying a perfect skateboard from the market can save you from the hassles of making your own. However, some people like to take control in their own hands and build the skateboards. Well, if you are among those people then search for the skateboard building guides as there are plenty of those available on the internet. 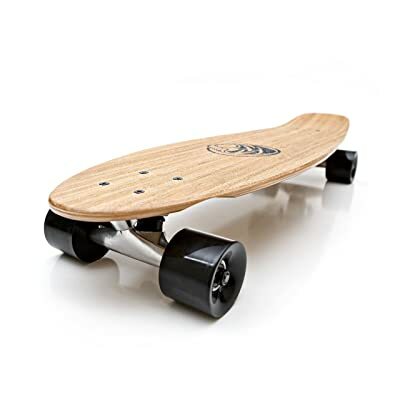 A skateboard will require various materials including deck (appropriate to the size of your kids), wheels, trucks, bearings, nuts, bolts, and grip tape. Now, install the trucks into the underside of the board. In case of the pre-made decks, be sure to attach the trucks on the right positions and then securely fasten the bolts. Remove the washers and nuts from the axle and insert bearings into the wheels. Now, first put the bearing on the axle followed by the wheel as you press it into the bearing. Repeat the step for all the wheels. Its time to install the wheels on the board’s truck. Make sure you do this carefully and secure the wheels with nuts. You have got your skateboard ready. There are various small and large details of the process. Make sure of following the comprehensive guide on the subject. The difference is of the size. The mini board is for tiny children, and they are lighter in weight. These boards are mostly half the size of a skateboard. Kids find it easy to roll them. The requirement changes as kids grow up. Skateboards are made of different materials, primarily wood and polymer. The deck board is made of wood, but it is covered with a layer of polymer which provides better traction and grip. It also boosts the balance of the kid. Skateboarding is a good way of exercise. The sport doesn’t only keep them healthy and fit, but they also inhale fresh air. There are plenty of safety features that companies are giving these days. To state a few, there are light wheels that prevent accidents in the dark as the cars can easily spot a skateboard coming. The overall construction of the boards has also mainly improved. While buying, simply make sure that the wheels have light and the board is supple. When not in use, a skateboard should be stored in cool and dry place. You can keep them in garage or mudroom where they are out of the way but still easily accessible. Make sure you don’t leave it outside in direct sunlight. The quality and outlook of the board will be ruined too steadily. Skateboarding is a great way for your kids to have fun and thrill. It also builds self-confidence in them. With all the options mentioned above, we hope that you will find the right product for your child. Keep in mind the tips that we have shared and buy the best skateboard for your child.